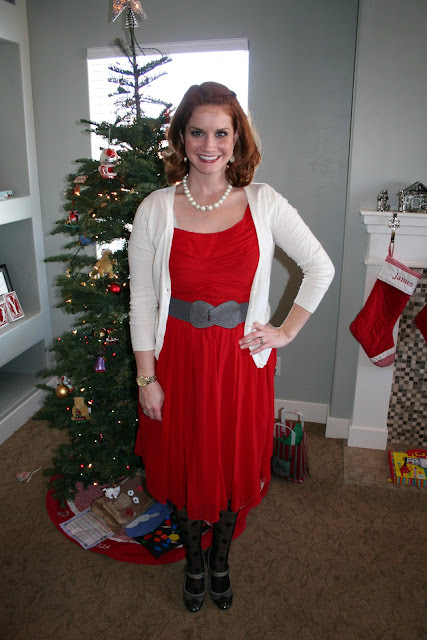 Tricia's Take: OOTD- Red for Christmas! Christmas was wonderful I am still cleaning up the aftermath! My oldest got a karaoke machine and is currently singing a Hannah Montana song at the top of her lungs, I am already thinking I will regret that purchase! Santa was good to me this year and I got an iPad 2, hubby actually said it was a gift for him since I use his iPad more than he does, so now he gets his back. This is a busy week for our family we celebrate our 10 year anniversary, my hubby turns 35 and New Year's! We are off for a little couples getaway to celebrate 10 wonderful years! And a picture of the little Christmas cuties!! We have a karaoke machine and use it more than the kids, ha ha! Happy Anniversary, Happy New Year, and you all look great in your Christmas outfits. Love that red dress! I wore the exact same dress... love how you styled it! You look radiant! Congrats on the 10th anniversary! Hope you have a smashing time on your getaway! Love the red on you...you look stunning! And congrats on 10 years!! Love your polka dot tights, Tricia! They look great with the bright red dress. Congrats on your 10th anniversary, and I hope you and the hubby are able to enjoy some QT together. Merry Christmas! You look lovely in red. And many congratulations on your anniversary. You look gorgeous in your Christmas red!!! 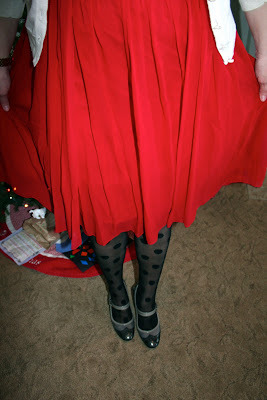 Love the cute polka dot tights too! Hope your New Years was a good one!